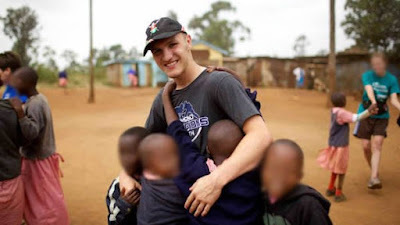 A missionary from Oklahoma US who volunteered at a children's home in Kenya was sentenced to 40 years in prison on Monday for sexually molesting three girls and a boy while working at the facility. Matthew Lane Durham, 21, was sentenced to 4 years in prison by Judge David L. Russell on four counts of "engaging in illicit sexual conduct in foreign places," according to court documents. "In a span of just 33 days," prosecutors wrote to the court, Durham "raped three girls -- ages 5, 9 and 15 -- at least eight times. During that same time period, he sexually molested a 12-year-old boy twice." The prosecutors said that Durham "not only forcefully sexually abused these children," but "he psychologically damaged them by taking advantage of their trust he received from the children." A jury found Durham guilty on seven counts of the charge in June, court records show. Russell acquitted Durham on three of the counts in January, writing that the prosecutors "failed to establish that he engaged in a 'sexual act' " with the children identified in those charges. Durham's attorney, Stephen Jones, told CNN on Monday that he plans to appeal the court's decision.